We recently began carrying two kinds of winch winders designed to make it easier for flatbed truckers to use webbing straps. These handy little devices wind up your straps right in place. There is no manual rolling or toolbox storage necessary. With a winch winder, you are spending less time taking care of straps and more time driving. So, how much time can you really save with a winch winder? It may not seem like much in the moment, but it is quite a bit when you add it up over an entire year. Remember that every minute you spend doing something other than driving, you are not making money. So keeping your wheels turning is critical to your livelihood. You can visit our YouTube channel and see both of our winch winders in action. You’ll see that it’s easy to wind up a strap in under a minute. But for easy math, let’s just say it took you one minute per strap and you’re using four straps to secure a load. It would take you a total of 4 minutes to wind and secure all your straps. Now what if you were rolling those straps manually? We will be generous and say it takes you 3 minutes to tightly wind each strap for storage. Now you’re looking at a total of 12 minutes as opposed to just 4 with a winch winder. A total of 8 minutes difference doesn’t seem like much. But if you saved that amount of time every single week for 50 weeks (you are on vacation for two), you would be saving 600 minutes annually. That works out to 10 hours. You save a full day of additional driving every year. How much is that worth to you? We bet you’ve probably never stopped to think about how long it takes to manually roll straps and store them away. Likewise, you’ve probably never considered how much time winch winders can save you over the course of a year. In the end though, it really boils down to efficiency. Winding a strap in place is far more efficient than pulling it off the truck, stretching it on the ground, and manually rolling it up. The efficiency comes by way of eliminating several steps. For starters, you are not actually removing the strap from the truck. It remains attached to the winder throughout. Second, you’re not having to stretch out the strap along the ground in order to manually roll it. And third, you’re not carrying the straps to your toolbox for storage. Everything occurs in place for the most efficient storage option of all. Again, we understand you probably don’t think a couple of minutes per strap is all that important in the grand scheme of things. And maybe it’s not. Perhaps you don’t haul enough flatbed loads to warrant, at least in your mind, investing in winch winders. But consider this: it’s all of those little things that add up. Truck drivers do a lot of things that have nothing to do with driving. There’s the pre-trip inspection, checking manifests, planning routes; and on and on it goes. All of those extra things add up to a lot of time the driver isn’t earning any money. The point of installing winch winders is not to save you $1 million on strap storage. It is to reduce the time spent doing one of those mundane tasks for which you don’t earn any money. And the end, every little bit helps. We were talking about some of the past conversations we’ve had with truck drivers when we remembered one particular conversation from about seven or eight years ago. The topic was parachute fabric and whether or not it was a good choice for truck tarps. Believe it or not, parachute fabric tarps were available back then. They were just not very popular. This particular discussion was more about whether or not parachute fabric was appropriate for lumber loads. The driver in question didn’t know much about the fabric, nor did we at the time. His concern was that it was too light to withstand over-the-road travel. He also questioned whether the fabric would flop around enough to damage the load. We did not have the answers back then, but we do have them now. Are parachute fabric tarps good for lumber loads? Absolutely. Like anything else, it is simply a matter of using them the right way. Let us first discuss how parachute tarps are constructed. They are made of a ripstop material, generally nylon, chosen for its weight and strength. The material is designated as ‘ripstop’ because of the special weave pattern that prevents small holes and tears from continuing to grow. Note that ripstop nylon will not hold back water forever. As such, most parachute fabric tarps still rely on a vinyl top panel to keep out moisture. Only the drops are made of the ripstop fabric. You still get a lighter tarp without sacrificing water resistance on the top. Next, it’s important to use edge protectors when you’re deploying parachute fabric tarps. Even though these tarps are made of ripstop fabric, they are still susceptible to being punctured on sharp edges. There is no point in risking the integrity of a tarp based on the notion that ripstop fabric makes it stronger than vinyl. Should you end up unintentionally puncturing a tarp, you can repair it. There is less risk of that puncture becoming a major problem due to the ripstop nature of the fabric. Finally, it is true that parachute fabric will flop around in the breeze more readily than vinyl. It has two things working against it in this regard. The first is its lighter weight. Second is a weave pattern that is specifically designed to catch the air. What does this tell truck drivers? To secure a parachute fabric tarp all the way around the load. Some drivers go around the perimeter using webbing straps or a series of bungee straps. Others use long lengths of rubber rope. Still other drivers attach bungees at each grommet and secure them to the trailer. How you go about it is entirely up to you. The point is to secure the tarp in such a way as to prevent as much movement as possible. At the end of the day, parachute fabric is an appropriate material for lumber loads. It is also great for steel, cable, machinery, and just about anything else you could carry on the back of a flatbed trailer. Just know that you have to be a little more careful at deployment and removal. Parachute fabric tarps are easily caught by the wind, so you have to be more deliberate in order to maintain control while you’re tarping. 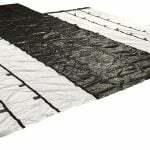 We are happy to say that Mytee Products carries a selection of parachute fabric tarps. We invite you to look over our inventory whether you’re looking to add to your existing tarps or replace those that are worn out or damaged. The ripstop nylon fabric used to make parachutes is a great material for truck tarps. It is just amazing that it took so long for tarp manufacturers to figure it out. But that’s a different topic for a different post. We want to use this post to discuss the necessity of using edge protectors with parachute fabric tarps. Since parachute fabric is quite durable, there is a tendency to treat it differently. Smart truck drivers know their parachute fabric tarps need just as much care as their vinyl counterparts. As such, the proper care of parachute fabric includes using edge protectors whenever necessary. One of the distinguishing characteristics of parachute fabric is that it is classified as ripstop fabric. Whether a parachute is made of nylon, canvas, or some other material, its ripstop designation comes from its cross-weave pattern that prevents rips and tears from growing. The last thing you would want as you are falling through the sky is to have a small rip become a huge, gaping hole. The thing to understand here is that ripstop fabric is not rip proof. If you are not sure that this is true, get yourself a piece of scrap material, lay it on top of a cardboard box, and see if you can put your utility knife through the center of it. Trust us when we say you’ll succeed. The point we are trying to illustrate here is that using edge protectors with parachute tarps still helps prevent rips and tears that could occur when tarp material comes in contact with sharp edges. The possibility of such rips and tears isn’t diminished simply because a tarp is made of parachute fabric. Sometimes truckers are forced to use edge protectors in order to protect the cargo underneath their tarps. In other words, you do not want fragile pieces of cargo rattling around and bumping into one another. So you secure each piece as tightly as you can and then use edge protectors as an extra insurance policy. Choosing parachute fabric tarps over regular nylon has no effect on the tendency of cargo to rattle around. So use edge protectors to keep individual pieces from damage during transit. Your customers will be happy on the other end. Another important reason for using edge protectors with standard vinyl tarps is the fact that sharp edges can wear away webbing strap material – even if said edges actually pierce the tarp material. This is an even bigger problem when you are dealing with parachute fabric, given that it is lighter and thinner than standard vinyl. Wherever there is likely to be friction between webbing straps and cargo, you should consider using an edge protector – even if there’s tarp material between cargo and strap. 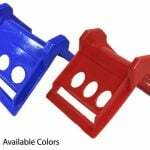 An edge protector mitigates friction and reduces the likelihood of a strap being cut. As an added bonus, the edge protector will also help keep your tarp in place to some extent. As you can see, truck tarps made of parachute fabric are not perfect or indestructible. They certainly do have some benefits over traditional vinyl tarps in terms of weight and durability, but they are prone to the same kinds of things that damage vinyl tarps. So do yourself a favor and protect your investment. Use edge protectors with parachute fabric tarps in the same way you would with canvas or vinyl.